When you think of social media, a slew of sites and apps probably come to mind. You most likely think of your Facebook, Twitter, Instagram, or Snapchat, and all the ways you use social media to connect and chat with friends and the world. The majority of the world can’t seem to go a single hour, let alone a whole day, without using or posting on those platforms in some way. It seems to be that social media has merely become a way of life in the 21st century. So much so that you’re sometimes excluded from certain things if you don’t have it. However, have you ever stopped to think about the negatives that go along with social media? No, I’m not just talking about the psychological or social issues that may often be associated with a lively online life, but instead, the potential hazard social media poses to your finances. Believe it or not, social media may not be great for your financial life. 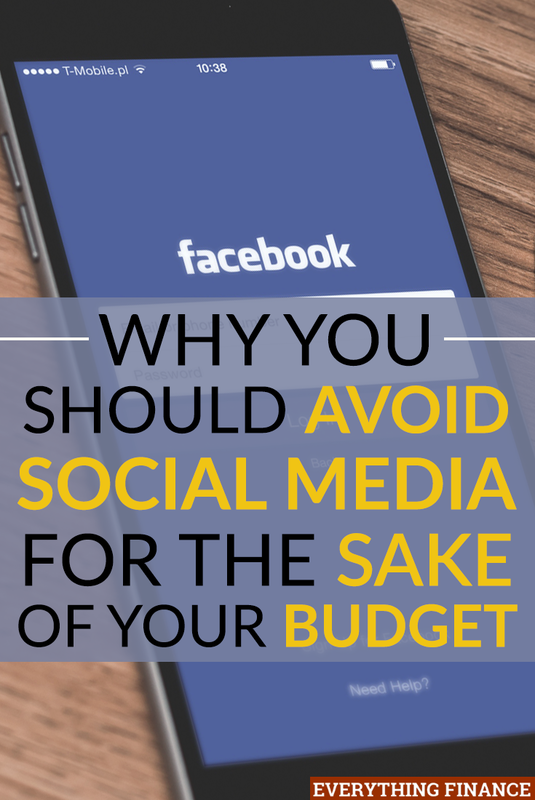 Here are some reasons why you should avoid social media for the sake of your budget. When people post on social media they tend to post about their whole lives. While it may seem harmless to share your life with the rest of the world, it could lead to you sharing information that you shouldn’t, such as a photo of your debit or credit card, or a check. This can be a trigger that leads to fraud. However, you don’t have to specifically share an important financial document to be vulnerable, as lots of other documents in your life could reveal important personal information, leaving you open to identity theft. Another scary aspect of social media that can leave you vulnerable is the fact that you post when you’re on vacation. Announcing that you aren’t home is an open invitation to thieves. That being said, while certain photos and announcements might seem harmless, always think twice before posting. The beauty of social media is that it allows you to share the aspects of your life that you want people to see, which means not only can you make your life look glamorous, but so can many others. This is especially true in the case of celebrities. Seeing other people’s luxurious lives can lead to more than just envy. If you see friends or celebrities buying expensive clothes, makeup, or cars, you may feel as though you need to go out and buy the same expensive items even though you don’t have the money to do so. Moreover, even if you can afford it, impulse buying isn’t a good habit to develop for your budget. For many, the addiction of social media comes with seeing how many followers you can achieve. This is often the case because many users hope to make social media their full-time job. If your end goal is to receive as many followers and comments as you can, you may get desperate enough to purchase followers and engagement. However, you’re likely only purchasing fake followers or robots that don’t really boost your online presence, all while spending valuable money in your budget. Don’t fall into the social media addiction trap. Instead, focus on curating an enticing account and growing your followers the old-fashioned way. If you’ve ever stepped foot onto a social media site, then it’s no mystery to you that you’re constantly bombarded with advertisements. The worst part about this is that the ads are usually targeted specifically to you. It’s easy to ignore random Internet ads that don’t pertain to you whatsoever. Social media sites, however, have a way of tailoring ads specifically to your personal interests, browsing history, location, and any other personal information you may have shared. That being the case, it can be harder to bypass ads if they’re actually displaying items and stores you love, which may cause you to spend extra money. Apart from avoiding social media, try to always keep in mind that you’re in control of your budget. Don’t let a website dictate how, when, or where you spend your money. Speaking of ads, you should always be aware of everything you click on when on sites like Facebook or Twitter. With the slew of Solo Ads presented to you, you might get in the habit of clicking on things without truly knowing what they are. Unless a clothing site or retailer is one that’s well-known and trusted, you may want to avoid purchasing items from them. Throughout the years, there’ve been more and more users who have purchased clothes from an unknown site, without knowing what they were getting, that have found themselves falling prey to scams. While this may seem obvious to you, you’d be surprised how many people spend the majority of their time at work on social media. Not only is spending too much personal time on the Internet at work a huge mistake, it’s one that could lead to your termination. More than that, however, employers nowadays often look at potential employees’ social media accounts before interviewing or hiring them. One wrong post, especially one complaining about your job, could lead to a missed job opportunity or promotion. Both are things that could help further your career and assist you in accomplishing financial goals for the future. Be smart and keep your accounts as clean and professional as possible. Social media seems like a harmless mode of communication. And it’s nearly impossible to avoid it when the whole of society places more and more importance on it every day. While this isn’t to say that you shouldn’t own any accounts whatsoever, you may want to think twice about how much time you actually spend on those accounts. You’d be surprised how much your budget will thank you. Have your budget or finances been affected by social media? Do you avoid social media for these reasons?